Fred Garitz was born in Germany May 17, 1847. (Parents were Frederick and Martha Wolf Garitz) He came to America when twenty-five years of age and settled first in Sheboygan. In later years he came to Spencer where he was married to Elizabeth Dimler (daughter of John and Anna Dimler, sister of William, Louis, Gus and Henry Dimler?). They moved to the town of Beaver thence to Greenwood, where he lived most of his life. Nothing found on any "Geer" family, also tried Geare, Geirl, Geary, Gier, Grier, Gries. Otto Geisler was born Oct 19 1859 (cemetery records: parents = William & Amelia Decker Geisler) in Sheboygan and passed away at his home in Greenwood, Sept 28, 1930, at the age of 70 years, 11 months and 9 days. His boyhood days were spent in Sheboygan. He came to Clark Co in 1878 and he and his father began to make a farm out of what was at that time a wilderness. He was married to Anna Conrad of Theresa, Dodge Co Jan 20 1881 and together they developed a fine farm which remained their home until 1926 when they moved to Greenwood. Their son William taking possession of the farm. On July 3rd he fell and broke his hip and was taken to the Marshfield hospital where he remained until Sept 17 when he was brought home. He leaves to mourn his death, his wife and three sons, Edward, William, and Adolph, (one daughter died in infancy). He was the last of six children, one brother having passed away in June. 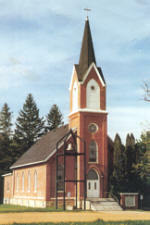 Services were held at Greenwood Reformed church. The body was laid to rest in the Braun Settlement cemetery. Mrs. Anna Geisler, 88, who since the death of her husband in 1930 had been making her home with her sons, Ed at Cornell and Adolph at Greenwood died Oct 24 1947 at the home of her son and daughter-in-law, Mrs. and Mrs. Ed Geisler. She had been in poor health since May 1946. Funeral rites were be conducted at the Schiller Funeral Home with interment in the Braun Settlement cemetery. Mrs. Geisler nee Conrad was born June 15, 1859, at Theresa and was married at Greenwood Jan 20 1881 to Otto Geisler. She came to Clark Co with her parents when she was a child, and after her marriage settled on a farm 6 miles northwest of Greenwood, where the Adolph Geislers now reside. Surviving are her two sons. A son, William, died in Janurary 1939, and a daughter died in infancy. Edward Louie Geisler, 94, who lived at the Thorp Care Center, died there on Nov 19 1975. Funeral services were held at the Rinka Funeral Home in Greenwood, with burial in the Cornell Cemetery. Edward Geisler was born Oct 4 1881 in the Town of Warner and received his education at Braun Settlement school. He was married to Amelia Decker (daughter of Fred and Mary Meier Decker) on June 3 1908. She preceded him in death Dec 26 1974. They farmed in the Town of Warner until 1944, then went to Cornell, where he worked for the paper mill and REA Electric Coop until 1946. From 1946 he lived in retirement and Cornell and Thorp. He is survived on one nephew, Ervin Geisler, Greenwood, and one sister-in-law, Mrs. Katherine Geisler, Owen. He was preceded in death by his wife and two brothers. William Frederick Geisler passed away at his home in Neillsville Thursday afternoon, January 26, after an illness of about eight years, the direct cause of his death being a stroke and hemorrhage. He was 55 years of age. Mr. Geisler was born in the town of Warner Feb 24 1883 to Mr. and Mrs. Otto (Anna Conrad) Geisler and had been a resident of Clark County with the exception of about 15 years. He was married Oct 12, 1907 to Ethel Howard of the town of Grant who survives him. Three children were born to them; Leola, Mrs. Jay Muno, Chicago; Cleon, who passed away January 7, 1929, at the age of 17; and Eileen, Chicago. He leaves also two brothers, Ed and Adolph of the town of Warner and one granddaughter, Patricia Muno. He had suffered several light strokes and other complications but gradually grew weaker and before Christmas his condition became serious. On January 11th he was taken to a nursing home at Humbird where he was given medical care. He was a graduate of the Daily School of Wisconsin and for a number of years followed the profession of butter-maker, operating creameries in the town of York, Christie and other places. In 1926 he purchased his father's farm and continued farming until his health failed, moving to Neillsville in the fall of 1936. Pallbearers were his old neighbors and friends of the town of Warner. They included Wm. Alperstett, Herman Damerow, Jake Speich, Edw. Braun, Gust Horn, and Wm. Schlinsog. Funeral services were held at the Schiller Funeral home, interment took place in the Neillsville Cemetery. "...Among the La Crosse loggers were: C. L. Coleman, G. C. Hixon, C. C. Washburn, Alex McMillan, D. D. McMillan, Ruel Weston, S. L. Nevins, Abner Gile, N. B. Holway, Levi Withee, John Paul, N. H. Withee, W. C. Root, W. C. Bussell, W. W. Crosby, Hiram Goddard, and others...." History of Clark Co.
William Goodwin passed away unexpectedly June 14, 1937 at the home of his son Ashley, near Hixton, Wisc, at the age of 74 years. He was born (parents = Royal and Jane nee Chambers Goodwin?) August 23, 1862 in the vicinity of Mauston, Juneau Co, Wisc. As a young man he worked in Black River Falls, where he lived for a year following his marriage to Luella Baker of that city December 3, 1889. Then after a residence in Juneau Co of two years, they moved to a farm near Greenwood where they lived 12 years. In October 1908 they moved to Loyal where for many years they made their home. For a time he worked in a new saw mill after which, for a number of years, he served as the janitor of the Loyal Public School. Nine children were born into the home, of who three survive. Those preceding Mr. Goodwin in death are Harry, Edward, Myron, Irvin, and the twin daughters, Eva and Effie. Those surviving are Ross of Whitefield, Mont; Ashley of Hixton, Wisc; and Myrtle, Mrs. Floyd Smith of Loyal. Because of the ill health of Mrs. Goodwin, Mr. and Mrs. Goodwin went to Arizona in the winter of 1932. Following her death in November the following year, he returned to Loyal. He has since made his home with his son Ashley and his daughter, Mrs., Floyd Smith. Funeral services were held from the Methodist Episcopal Church with interment in the Greenwood Cemetery. Mrs. Goodwin passed away at the home of her son Ed. in Tempe, Ariz., October 29, 1933. Mrs. Goodwin had been in poor health for over a year. Last February at the request of her son and his wife, she and Mr. Goodwin left their home in Loyal and went to be with them where she received the best care, but the dread cancer from which she was suffering caused her death. Mrs. Goodwin, whose maiden name was Luella Baker, was born in the town of Irving, Jackson Co, Wis Jan. 14, 1869, the youngest daughter of Mr. and Mrs. John Baker. When about five years of age she moved with her parents on a farm near Shamrock and when she was sixteen they moved to Black River Falls. On Dec. 3, 1889 she was married to William Goodwin. They lived in Black River Falls for a year and then moved to Juneau Co for two years and then to a farm near Greenwood for twelve years and in Oct. 1908 they moved to Loyal where they have since made their home. Nine children were born to this union: Ross, Harry (died 1903), Edward, Myron, Ashley, Irvin: twin daughters Effie (died 1907) and Ella (Eva, died 1905), preceded their mother in death. Those left behind are Ross of Whitefish, Montana; Ed. of Phoenix, Arizona; Ashley of Black River Falls and Myrtle, Mrs. Floyd Smith of Loyal. Her remains was brought to Loyal by her sorrowing husband. Funeral services were held at the Free Methodist Church in Loyal. She was laid to rest in the cemetery at Greenwood by the side of her departed children. Edward Goodwin a former resident of Loyal, passed away at his home in Tempe, Arizona, April 29th. Mr. Goodwin had been in ill health for several years, having been afflicted with asthma and heart trouble. Mr. and Mrs. Goodwin moved to Arizona in 1928. Military funeral services for Edward Goodwin were conducted from the Carr Mortuary, interment was at Double Butte Cemetery. Pallbearers were legionaires. Taps were sounded at the grave and the firing squad was in charge of the Arizona National Guards. Edward Goodwin died at the family home, 1104 South Ash Avenue, the 29th day of April. He had been in ill health since his discharge from the army 17 years ago, previous to that time having served 18 months during the world war. Mr. and Mrs. Goodwin made their home in Tempe, Arizona, going there from Loyal in 1928. He is survived by his widow, Mattie, two sons Ennis and Floyd Clifford, and his father William Goodwin, Loyal, two brothers Ross Goodwin, Whitefish, Montana; Ashley Goodwin, Black River Falls, Wis., one sister, Mrs. Floyd (Myrtle) Smith of Loyal, Wisconsin. His mother, two sisters and three brothers preceded him in death. On Friday evening of last week the remains of Myron Goodwin were sent home for burial. He was instantly killed on Jan. 18, 1915, while standing on top of a freight car that was switching in the railroad yards at Schenectady, N.Y. Myron was born on a farm in Greenwood, Clark Co, Wis., on May 2, 1899. He moved to Loyal with his parents about six years ago, where he has since lived. He leaves to mourn his death his father and mother, four brothers, Ross, Edward, Ashley and Irvin, and one sister, Myrtle, all of Loyal. He was buried at Greenwood beside his one brother and two sisters who have gone before him. Irvin Goodwin, son of Mr. and Mrs. Wm. Goodwin of Loyal, was born a short distance north of Greenwood July 13, 1903, and passed away June 21, 1932 at the age of 28 years, 11 months and 8 days. At the age of five years he moved with his parents to Loyal where he attended the Loyal Public School. Later he went to Greenville, South Carolina, where on December 23, 1922, he was united in marriage to Miss Pearl Greene of the same place. Here they made their home until the 6th of February, 1932, (?1922) when he returned with his wife to Loyal. In October 1924 they returned to South Carolina where they made their home until June 1927 when they again returned to Loyal where they resided ever since. To this union five children were born. Effie Wilma age eight, Daisy Virginia, age six, Mamie Lucila, age five, Irvin Jr. age three, and Glen Vern age nine months. Goodwin, who worked for the county, had gone to the Aug. Luber home, about 4 miles north of Loyal on County Trunk K for a drink of water. Goodwin had walked to the Luber home and upon returning to the highway hailed a truck driven by Chris Bentzler. While the truck was still going a good rate of speed Goodwin attempted to jump onto the running board but his hand slipped from the open cab window and he fell under the truck, which was loaded with gravel. The wheels passed over his head and he died almost instantly. An inquest was held at Loyal at which his death was pronounced as accidental. He leaves to mourn his loss, his wife and five children; his parents Mr. and Mrs. Wm. Goodwin of the village; three brothers, Ross of Whitefish, Montana, Edward of Phoenix, Arizona, Ashley of Black River Falls, Wis., and one sister, Mrs. Floyd (Myrtle) Smith of Loyal. Two brothers and two sisters preceded him in death. Funeral services were held in the home of his parents, and in the Free Methodist Church. Interment took place in the Pine Grove Cemetery. Those from away who attended the funeral included his brother Edward of Phoenix, Arizona, his brother Ashley and family, and Mrs. A. Bailey from Black River Falls. Myrtle Smith, 68, a former teacher in the rural schools of Clark Co, Wis. and in the Sumner District, of Sumner, Wash., died Oct. 21, 1976, while visiting her daughter in Benton City, Wash. She was married to Floyd Smith of Loyal Sept. 20, 1928. They farmed in the Loyal area until 1960, when they moved to Sumner, Wash. Mr. Smith preceded her in death in 1971. Mrs. Smith was born in Loyal, Wis. She was teaching in Bonny Lake Elementary School at the time of her retirement in 1972. Mrs. Smith graduated from the Stevens Point State Normal School in Wisconsin and had attended Pacific Lutheran University, Tacoma, Wash. She was a volunteer tutor and spent much time teaching the English language to Vietnamese refugees. She also was an active member in the Sumner Free Methodist Church. Survivors include three daughters: Mrs. Ted (Ila Mae) Nelson of Sumner, Wash; Ms. Darlene Ystad of Puyallup, Wash.; Mrs. Bobby (Carla) Lane, of Benton City, Wash.; a son, Myron Smith of Indonesia, a brother, Ashley Goodwin of Winston, Ore., 2 sisters-in-law, Vera Roder and Carrie Smith of Loyal. Interment was in Companion Gardens , Sumner Cemetery, Sumner, Wash. under the direction of Sumner-Voiles Funeral Chapel. Daughter W F 1 S Wisconsin Iowa/La. 1906: "Henry Grass was called to Fennimore, Grant county, Friday by the death of his sister's husband. The week before he received word that his father was dead, but was unable to get away to attend the funeral." Beaver township: Grass Sawmill--Milt Ystad, a long time square dance caller in Clark Co remembers seeing the footings of this industry in Section 19 when he lived nearby. At best guess, he feels the business probably dated back to the turn of the 20th century. The property is now owned by Jim and Joan Turnquist. Denver Green, born c1871, son of Phoebe nee Pierce and unknown Greene. No further records found on that Green marriage. Clark Co. marriage licenses Vol 1 page 71, 5 March 1874 has Phebe Pierce (using her maiden name) with unlisted groom. Checking back to grooms there is the same vol, page and date for Abner Peterson with no bride listed. One would assume the two were married but in checking cemetery records this might not be so. Greenwood cemetery has Abner Peterson (1855-1936) married to Elizabeth (1857-1928, no further info on her). Phoebe Pierce was born c1853. She probably first married Green c1870, then married Abner Peterson 5 March 1874 when Denver was about 3 years old but for some reason the marriage was disolved and he then married Elizabeth. Phoebe age about 30 married third, Henry T. Oxford on 30 Jan 1883 when her son Denver Green was about 12 years old. Phoebe nee Pierce had at least two sisters and one brother per the 1918 obit of Pamela Pierce Harding at which time she was living in Montana. Married, at the residence of the bride, in Greenwood, Clark County, Henry T. Oxford to Phoebe Mae Peterson, both of the village of Greenwood. 1894: Henry Oxford has put in 470,000 ft. of logs into Rock Creek this winter for the Coburn estate. March 9, 1900: Henry Oxford has sold out his dray business first to Hastings Baird who the next day sold it to Cha. Kippenhan. Mr. Oxford expects to spend some time in other parts and will probably leave today. Aug 23, 1901: Mrs. Frank Peterson writes to Mrs. Henry Oxford that her parents, Fred Schilling and wife, arrived at Salem, Oregon, in good health and well pleased with the country. They are going farther west, however, to settle, deciding to get more into a fruit country. Feb 1906: Henry Oxford of Greenwood, the man who four weeks ago came to this city and during a conversation lost his voice, was here again the first of the week fully recovered. He said the recovery of his voice came about by the constant use of hot milk. Marshfield News. Otto Gruwell, farmer in the Town of Warner, died Jan. 29, 1935. Deceased was 70 years at the time of his death. Forty eight years ago he was married to Miss Arvilla Drinkwine, the wedding taking place at her childhood home, which is now known as the Gruwell farm. He is survived by his wife and two sons, Ed of Ventura, Cal., and Asa who is a veterinary near Green Bay. Funeral services were held at the Schiller Funeral Parlor. The body was laid to rest in the Greenwood Cemetery. Mrs. Otto Gruwell, 75, who lived in the Village of Greenwood, since 1935, died Nov. 16, 1943 at her home. She had been confined to her bed the past 18 weeks. Mrs. Gruwell, the former Minnie Arvilla Drinkwine, daughter of the late Mr. and Mrs. Larry Drinkwine, Sr, was born May 27, 1868, at Plymouth and was married at Merrillan Aug. 1, 1891. After their marriage the Gruwells lived for a time at Thorp and later moved to a farm 4 miles northwest of Greenwood. Shortly after Mr. Gruwell's death Jan. 29, 1935, Mrs. Gruwell and her niece, Miss Mae Drinkwine, who made her home with the Gruwells for many years, moved to the village of Greenwood. Surviving besides her niece is a son, Ed, who lives in California. Another son, Asa died in 1940. Funeral services were conducted at Grace Methodist Church, and interment was made in Greenwood Cemetery. Asa George Gruwell, son of Otto Gruwell and Arvilla, nee Drinkwine, was born in the Town of Warner on Dec. 4, 1890. After attending the public school in his township, he entered McKillip's College for students of Veterinary in 1914, graduating from this course in 1917. In 1921 he again entered a school for a post-graduate course of one year at St. Joseph's Veterinary College in Kansas City, Missouri. On Jan. 18, 1917 he was married to Elizabeth Shemmine in Chicago. In April of that year he settled in Bonduel, Wis., where he has since resided and followed his profession. Here were born his two children, Miss Elizabeth, a registered nurse in a hospital at Shawano, and George, recently a high school graduate. In Bonduel Mr. Gruwell was president of the Chamber of Commerce for the past year and for two years was president of the County Conservation Club. On Aug. 12 of this year he suffered a breakdown in health and though he was again on the gain, a second cerebral hemorrhage last Wednesday, which produced a state of coma until Friday, presaged the end. He passed away on Friday, Oct. 11, 1940 reaching the age of 49 years, 10 months and 7 days. Funeral services were held at the Schiller Funeral Parlors and at Trinity Lutheran Church. Interment was made in the Greenwood Cemetery. He is survived by his wife, daughter and son of Bonduel, his mother of Greenwood, a brother Ed in California, a cousin, Miss May Drinkwine, who makes her home with his mother. His father died in 1935. Pete Anderson, (lived in Warner sec 28) a bachelor, who had been the servant of a Norwegian prince, came to Greenwood in 1875. He had a fight with a bear while in Norway, and had killed the bear with his only weapons, a jack-knife and his fists, but was about as badly used up as the bear and was terribly scarred. From this he was nicknamed "Old Bear Pete". He obtained a piece of land west of the river and in 1876 proceeded to build a log home. He built his house and had logs rolled up for a barn, when he, went out one morning to work while his coffee boiled. He was sawing the logs out to -make a doorway, when one fell, striking and breaking his leg, and he alone with only a trail past his place with few passersby! Charles Varney, then a young lad, passed near enough to hear his cries for help, but not understanding the call, was afraid to answer, so "Old Bear Pete" lay on the ground all day. That evening when Annie Guldbrand, a neighbor, was out looking for her cow she heard someone calling and told her husband to go and see if something wrong with Pete, which he did and found him lying on the ground not far from where he had fallen. He recovered from. this, too, and was able to finish his barn, clear his land, grub out the stumps, make maple sugar, and perform all the numerous duties of a pioneer, though always very lame. He even entertained company, and one time Dorry Bailey (who had a habit of tasting everything he saw) picked up a chunk of maple sugar and ate it, which "Old Bear Pete" had been sucking on for a week. As Pete grew old he lived with his nephew, Sam Severson where he would take a chair to the woods in which to sit and chop down trees and saw them into wood. He died at Severson's in May 1915. No info on any Guskenburgh family.